Through Wed., July 13: SummerStage provides New Yorkers with free music, theater and dance performance, with performers ranging from hip-hop pioneer Talib Kweli to indie rockers. This season we will offer over 300 artists, with over 100 performances in 18 parks across the 5 boroughs. Thurs., June 16, 7 p.m.: Jon B/Olivia @ Herbert Von King Park. Jon B is an accomplished musician, noted songwriter and producer who combines 1970s soul with hip-hop influences in his debut album, Bonafide. Olivia is not only a singer but also a composer, producer and arranger brought on by super-producer Dr. Dre and rap icon 50 Cent as the First Lady of G-Unit. 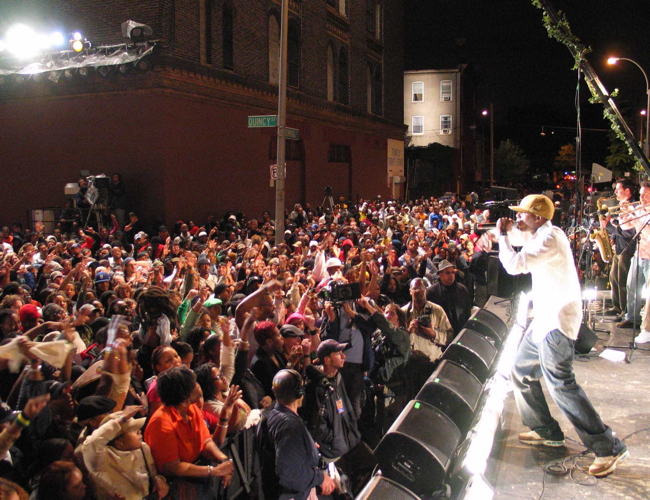 Tues., June 21, 7 p.m.: Talib Kweli @ Red Hook Park. For 15 years, Talib Kweli has been a king of New York hip-hop with an expansive international audience. Kweli’s work with Mos Def on the famed album, Black Star, stands as one of hip-hop’s premier collaborations and was instantly hailed by critics upon its release. DJ Stormin’ Norman, founder of the incredible feel-good event series, Sundae Sermon, plays soulful house, disco, classics, afro beats, Latin and other genres. Tags: Florence and the Machine, Jon B/Olivia, July 13: SummerStage Concert Series, June 7 to Wed., New York Parks, performance, Summer 2011., Talib Kweli, Tues.